Plusle in game: 4,207 Who? Important notice! Pokemon Plusle is a fictional character of humans. Plusle can compose sparkly pom-poms by shorting out the electrical current in its palms. It uses these pom-poms to cheer on its teammates, and will cry loudly if they lose. It climbs telephone poles to absorb electricity. It lives in grassy areas. 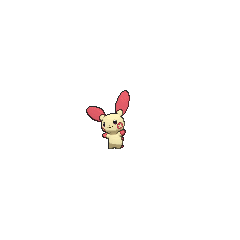 Plusle first appeared alongside Minun in A Different Kind of Misty!. Both Pokémon were owned by Thatcher, who is responsible for protecting a lighthouse. The same Plusle and Minun appear again in Cheer Pressure, where Thatcher is training them to be cheerleaders. Elijah used Plusle and Minun as actors in Lights, Camerupt, Action!. The plot of the movie was that Pikachu, Plusle and Minun were setting out to rescue Princess Kirlia from an evil Exploud. 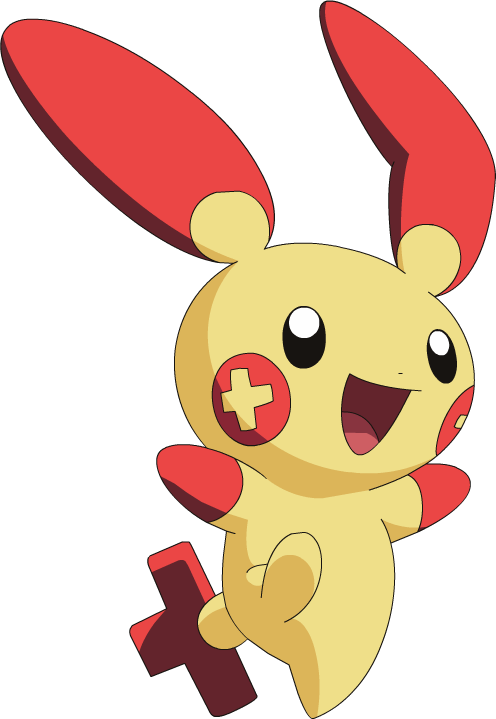 Plusle and Minun also appear as supporting characters in the film Destiny Deoxys, serving as the story's comic relief. The pair helps Tory Lund to overcome his fear of Pokémon. Solana's Plusle also appears with her each time she herself makes an appearance, except Pokémon Ranger and the Kidnapped Riolu! Parts One and Two. It is the only one so far not to be seen with a Minun partner. 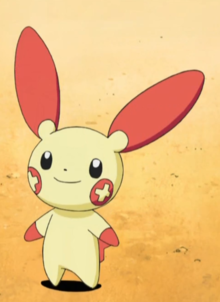 Another Plusle appeared in Yes in Dee Dee, It's Dawn! and Playing the Performance Encore! alongside its counterpart under the ownership of Ursula. Also, in the same episode one appeared along with a Minun in Dawn's flashback when she confessed that as a child, she had a fear of both of them. Plusle along with Minun had a cameo in Pokémon Mystery Dungeon: Team Go-Getters Out of the Gate! where they were rescued by Team A.C.T. Multiple Plusle appeared in The Future Is Now, Thanks to Determination!. A Plusle appeared in Performing with Fiery Charm! alongside Minun, under the ownership of a Pokémon Performer participating in the Dendemille Town Pokémon Showcase. It reappeared in A Performance Pop Quiz! alongside Minun and its Trainer and again in Master Class is in Session!, where it was used in the Master Class Pokémon Showcase in Gloire City. A Plusle appeared in Party Dancecapades!, under the ownership of a Pokémon Performer participating in a dance party. 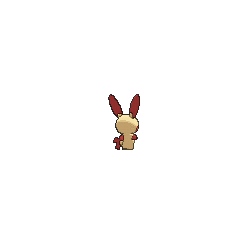 A Plusle appeared in Battling With a Clean Slate! alongside a Minun, under the ownership of an unnamed Trainer. DP161 Plusle Ash's Pokédex Plusle, the Cheering Pokémon. 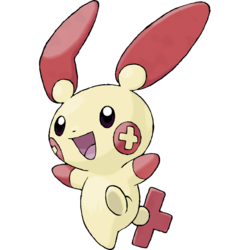 Plusle loves to cheer for its fellow Pokémon, and it composes sparkling pom-poms by shorting out the electrical current released from its palms. Ruby owned a Plusle that he met at the Abandoned Ship. It later appeared on Mirage Island, where together with Sapphire's Minun, helped the two rivals learn how to work as a Double Battle team. Plusle is the only known Pokémon of Hareta's father, Kaisei. 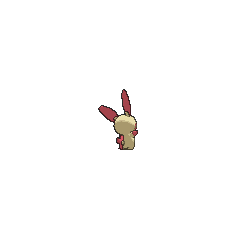 It seems to be related to Hareta's Minun. Excess data found on the game disc includes data for seven playable characters cut from the final roster, including Plusle and Minun as a tag team akin to the Ice Climbers. 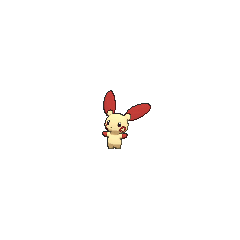 However, in the final version of the game, Plusle just appears as a random trophy alongside Minun. Plusle always acts as a cheerleader for its partners. Whenever a teammate puts out a good effort in battle, this Pokémon shorts out its body to compose the crackling noises of sparks to show its joy. It has the trait of cheering on its fellow Pokémon. By shorting out the electricity it releases from its paws, it composes pom-poms for cheering. It absorbs electricity from telephone poles. It shorts out its body to compose crackling noises.